Despite his young age, Samuel Kamau Wanjiru has already made history by setting the world half-marathon record thrice in two years - and yet has a distinctly un-Kenyan running style. While most of Kenya's great marathon runners have been characterised by a fluid running style with long strides, Wanjiru runs with his chest arched outwards, hands moving mechanically - and wears a permanent grimace as if to suggest that he is struggling. But far from it. The 21-year-old athlete is developing into something of a phenomenon. Wanjiru started running aged 15 in Nyahururu under no supervision, inspired by John Ngugi - Kenya's five-time World Cross Country champion. He rose to global stardom three years later, when, rather than sweating over his school books, he was sweating on the streets by setting his first half-marathon record. As a first step in standing out from a crowded Kenyan field, he ran an amazing 59 minutes 16 seconds in Rotterdam, to break Paul Tergat's record which had stood for seven years. What makes this more remarkable is that he did this only two weeks after setting the then-fastest junior world 10,000 metres time. Both feats sealed for him Kenya's Most Promising Sportsman of the Year title in 2005. Wanjiru is almost obsessive about turning so-called failure into victory. When he lost the half-marathon record to Ethiopian legend Haile Gebrselassie in 2006, he came back with a bang - breaking it twice in two months the following year to set a new mark that stands to date. First he clocked 58 minutes 53 seconds to win the Ras al Khaimah International Half-Marathon in the United Arab Emirates in February 2007, and then a month later - almost as if running against himself - he smashed his own record by running 58 minutes 33 seconds in The Hague's Fortis City-Pier-City Run. "It was really fantastic that I was able to regain the world record and bring it back to Kenya," recalls Wanjiru. "From the 17km mark onwards I tried to go it alone, and as I glanced at my watch after 18km I felt that the world record was within my grasp - and so I went all out for it." What sets the diminutive athlete apart is his incredible ability to start on and sustain a killer pace throughout a race. This is in contrast to his compatriots who prefer a measured approach with varying speed. Without question, Wanjiru is no ordinary athlete but there are other things that make him unique in Kenya. Unlike most elite Kenyan marathon runners, Wanjiru hails from the Central Province, a region that significantly pales in comparison to the epicentre and incubator of the ultimate distance talent - the Rift Valley. The only other reputable marathon runners from Central Province are two-time World Champion Catherine Ndereba and Olympic silver medallist Eric Wainaina. 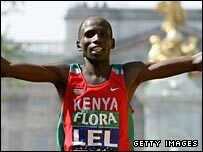 In contrast, the Rift Valley has produced the likes of Felix Limo, Martin Lel, Tergat, Robert Cheruiyot, Moses Tanui, Tegla Loroupe, Joyce Chepchumba and Susan Chepkemei. Since 2002 Wanjiru has been based in Japan - after winning a cross-country race organised to scout for talent. He enrolled in high school there and speaks Japanese. Now he trains under a Japanese coach, Koichi Morishita, who won a marathon silver at the 1992 Olympics in Barcelona. Morishita has imparted important aspects of marathon running to his young protege by showing him videos and instilling Japanese virtues in him to influence his running style. "He can set a world record in the marathon, but I would like to emphasise winning over achieving a fast time. I like to coach a winner," Morishita has said. "Wanjiru never gives up during the race. Such characteristics are important for the marathon." In April, he makes his first appearance in the UK's London Marathon just months after setting a course record when he won his debut marathon in Fukuoka, Japan. He joins an illustrious and crowded field - with compatriots like two-time champion Lel and 2006 winner Limo. 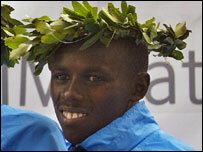 But Wanjiru has his sights firmly trained on a record time in London. And Anna Legnani, deputy director of communications at the International Association of Athletics Federations, the sport's governing body, says that Wanjiru has the potential to become one of the greatest ever. "It is quite exceptional for an 18-year-old athlete to set a world record in the half-marathon," she said. "In fact, the only other athlete in the All-Time Top 20 lists for half-marathon or marathon who was under 20 at the time of his performance was Tanzania's Faustin Baha. Wanjiru's precocity clearly sets him apart."